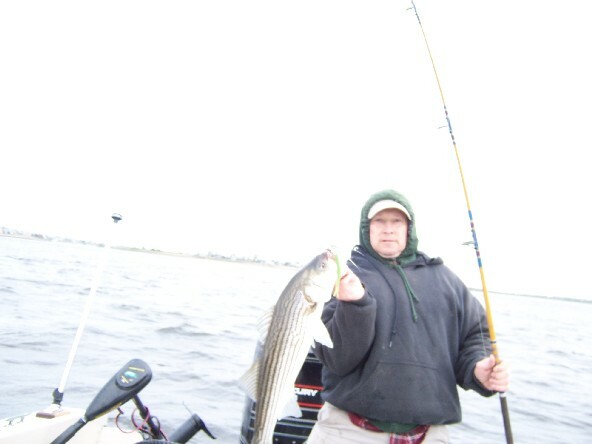 I’ve only been hearing about shad this week, but then Roccus, one of our most devoted striper guys, sends out these pics. At least a couple stripers up either near or in the river. Judging from the photographs, I’d say one was out front along the beach in a boat, the second appears to be upriver a bit. SPOTBURN AHHHHHHHHHHH J/K Hope this is everyones best fishing yr yet!!!!! lets getm. small soft plastic shad baits are a sure thing right now…. Hey Sam b…..use a small elastic or elastic string and wrap it around your clam when on the hook….you clam will stay on the hook longer. 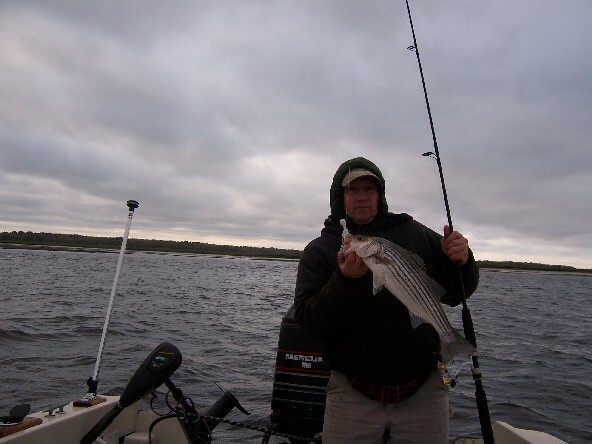 I agree with the comments of these caught fish likely being river holdovers….look at how skinny these fish are. Those wern’t holdovers and they were caught in the river…. 1.5 ounce upperman style jigs with soft plastic tails….